Using the latest dynamic code from Net Entertainment, Twin Spin is a new concept 243 pay line video slot that clones reels to increase payout performance through symbol duplication. It’s a fairly retro looking game that pays tribute to the classic Las Vegas slots era but also packs state of the art technology into five reels like never before seen. You can play Twin Spin for real money or free play on mobile or desktop, it works with a payout rate of 96.6% RTP and there’re plenty of chances with 243 ways to win. 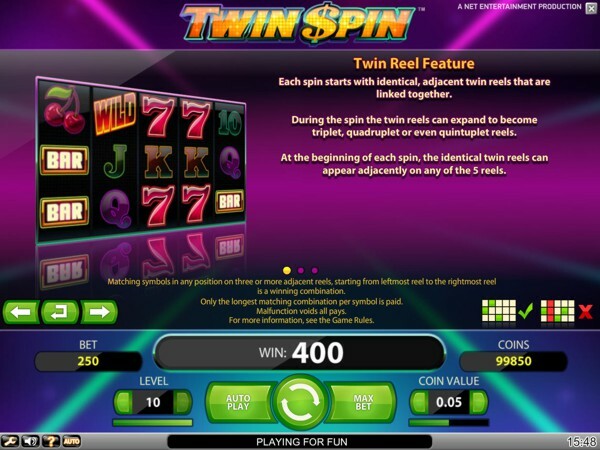 Twin Spin from NetEnt is a 5-reel 243 bet line video slot based on the classic design of Las Vegas-style slot machines that uses synchronisation to link reels across a (9 x 9 x 3) payout grid. In theory, it’s more ways to win, and players can cover all pay lines from just 25p per spin, so NetEnt’s play on (Win Ways) works. Style-wise, it’s retro to look at; there’s an overwhelming soundtrack that screams 1980’s game show, and it’s very bright on the eyes, but it’s also very clever. Twin Spin offers players fast-paced gaming with an old-school polish and potentially huge wins thanks to the rules of double play. We’re possibly thinking a Starburst Dazzle Me hybrid slot, possibly, maybe? During the review of Twin Spin, we selected both Twin Spin Touch and the desktop variant to gauge the feelers for playability and performance. What’s nice is that Twin Spin doesn’t try too hard to look good, it’s not about the visuals, it’s about the gaming experience. Certainly the graphics are using NetEnt’s most current drivers, and decent displays will see everything, but it’s the motion that impresses foremost. The Twin Spin Slot moves gracefully and by that we’re talking crisp animation, this gets even better when the linked reels activate. In terms of betting, real money players get the simple controls and stakes are vast from just 25p to a high roller powered £125 per spin. Whether you’re playing Twin Spin Touch on mobile, or it’s desktop big brother variant, you can’t help but get excited about this quirky and retro slot that offers lots of payout power. On the reels and its business as usual and back to basics, any classic slots fan can see that. NetEnt went back in time with this one dressing down Twin Spin with Las Vegas style vintage and supercharged neon particles for added effect. It’s a three level payout table as we’d like to put it, breaking down the symbols into low, medium and high paying variables. Play Twin Spin for real money and you’ll come across card values 9 – A that can pay up to 40 coins. Cherries, bells and bars make up the middle payout scale to 400 coins with 7’s and Diamonds top of the tree. 5 of a kind diamonds award 1000 coins returned. As for bonus icons, there’s only really one, and that’s a very 80’s looking Wild shoved in to help boost marginal wins. In time, Twin Spin has the potential to become one of the top UK online slots for real money players, but that’s not down to the features. Keeping things simple, this 243 pay line video slot is closer to the roots of Starburst than a multi-level bonus game. Therefore, things happen in the base game as opposed to outside of it. 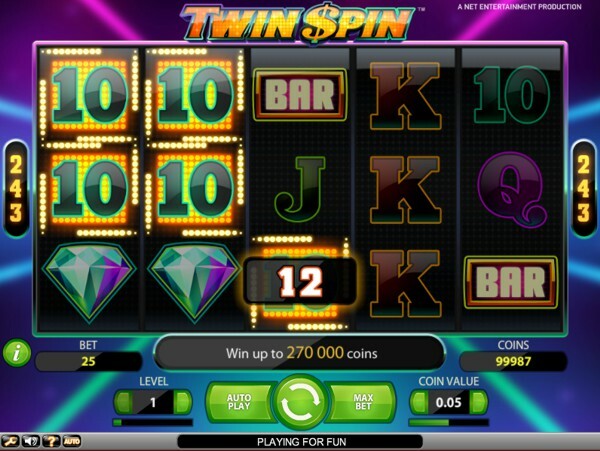 The Twin Spin Slot features include Wilds that do the usual winning substitution and a uniquely designed linked reels system, the slots main favourable attraction. These two features are the same on the Twin Spin Touch mobile slot and the desktop casino game version. We’ll not chat about the Wild’s because they’re standard, and although not super special, they can still help win you the game. The linked reels, on the other hand, do offer something quite special. It’s a feature that offers players the chance to spin two reels at the same time, using identical synchronisation to increase the possibility of winning cash. So how does it work? If you’re playing for real money then covering pay lines matters, in Twin Spin it matters only you’re covering more possibilities than with most other online slots. As you spin the funky reels, you’ll notice that two random reels will appear as clones, effectively twins that can increase the chances of lining up winning combinations. (Now a game that can do that with 243 betting lines is well worth spinning). It’s also a feature that is constantly in play. Twin Spin is the sort of game that will attract mobile slots players and online casino members who wager real money, because of its incredible pay line matrix and betting flexibility. With all areas covered, you can play Twin Spin from just 25p per spin up to a £125 maximum bet. That’s working with ten betting levels and coin values of 0.01 to 0.50 to offer the play cost above (Remember that each spin covers all 243 pay lines). The Twin Spin Slot Jackpot is 1000 coins but up to 270,000 coins can be won by other means, often through cross multiplication of paying lines. Twin Spin has a payout rate of 96.6% RTP and is considered medium to high variance, both Twin Spin slots for mobile and desktop offer free play too prior to real money betting. The review of NetEnt Twin Spin has left Slotsquad with a more than adequate testimonial for the premium developers funky (Win Ways) slots hybrid of classic gameplay and modern pay line innovation. At first glance it’s a step back in time, there’s a hip soundtrack, and it’s visually trendy, but spin the reels and there’s a modern twist in its belly. Available as Twin Spin Mobile Slot Touch for smartphone and tablet, or as an online slot for desktop, NetEnt’s dazzling five-reel 243 pay line slot will play well on everything. Expect old-school with the up to date, a low spin cost for potential big wins, and not one chance of winning but two. Meet the best-linked reels cloning system we’ve seen so far in the gaming industry, it’s Twin Spin.